Elasticsearch is pretty nifty in that searching for documents that contain an array item requires no additional work to if that document was flat. Further more, searching for documents that contain an object with a given property in an array is just as easy. Using a boolean query we can extend this to find all documents with a tag object with tag find me or tagtype list. But what if we only wanted documents that contained tag objects of tagtype list *and* tag find me? While the above query would find them, and they would be scored higher for having two matches, what people often don’t expect is that hide me lists will also be returned when you don’t want them to. This is especially surprising if you’re doing a filter instead of a query; and especially-especially surprising if you’re doing it using an abstraction API such as elasticutils and expected Django-esque filtering. This saves a whole bunch of complexity (and memory and CPU) when implementing searching, but it’s no good for us finding documents containing specific objects. The solution to finding what we’re looking for is to use the nested query and mark our object mappings up with the nested type. This preserves the objects and allows us to execute a query against the individual objects. Internally it maps them as separate documents and does a child query, but they’re hidden documents, and Elasticsearch takes care to keep the documents together to keep things fast. We then make a nested query. The path is the dotted path of the array we’re searching. query is the query we want to execute inside the array. In this case it’s our boolquery from above. Because individual sub-documents have to match the subquery for the main-query to match, this is now the and operation we are looking for. As part of PyCon Au this weekend I did a lot of hacking on my laptop, which is not something I’ve done for a while, given how much I used to hack on my laptop. I was frequently getting annoyed at how my vim config wasn’t the same as it’s currently on my work desktop. Back in uni, I used to keep my dotfiles in revision control on a machine I could connect to. All I needed was my ssh agent and I could get all my config. Recently, when wanting to extend my vim config, people’s pages tell me to do it through vim pathogen, which I didn’t have set up. Also there have been times when people have asked for my vim setup, which I wasn’t easily able to provide. Given all of that, I decided it was time to rebuild my config using pathogen + git submodules from the ground up. As part of this, I updated quite a few plugins, and started using a few new things I hadn’t had available without pathogen, so it’s still a bit of a work in progress, but it’s here. Installing new plugins is easy with git submodule add PATH bundle/MODULE_NAME. If you’re a vim user, I strongly recommend this approach. I’m at PyCon Au.1 I made it this year. There were no unexpected collisions in the week leading up to it. 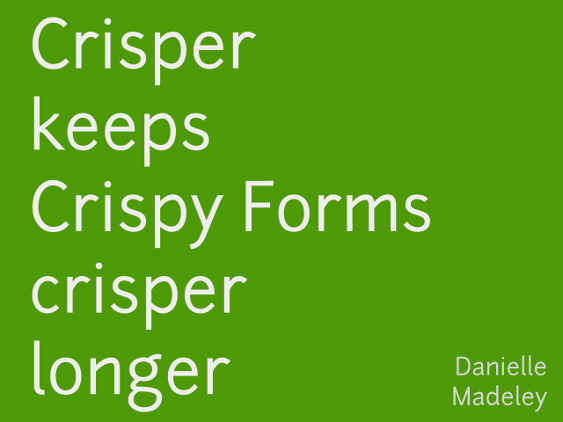 I decided at the last moment to do a lightning talk on a piece of Django-tech I put together at Infoxchange, a thing called Crisper, which I use in a very form-heavy app I’m developing. Crisper is going to be up on Github, just as soon as I have time to extract it from the codebase it’s part of (which mostly consists of working out where it’s pointlessly coupled). Anyway so some pretty good content today at DjangoCon Au. I especially enjoyed the food for thought about whether we should be targeting new development at Python 3. It has struck me that writing greenfields code on Python 2 is a dead end that will eventually result in my having to port it anyway. Thinking I will conduct a quick stocktake of the dependencies we’re using at work to evaluate a Python 3 port. I think generally we’re writing pretty compatible code using modern Python syntax, so from the point of view of our apps, at port at this stage would be fairly straightforward. This is actually a nice aside that I’ve been working on a pure in-web app for visualising data from Redmine using D3.js and Redmine’s RESTful API.3 Intending to add configuration in localstorage (probably via Angular) once I have the visualisations looking good. It both serves a practical purpose and an interesting experiment on writing web apps without a web server. Finally, I’m trying to recruit talented web developers who have a love of Agile, test driven design and Python. Also a technical tester. Come and talk to me. I’m looking for a PaaS provider that isn’t going to cost me very much (or anything at all) and supports Flask and PostGIS. Based on J5’s recommendation in my blog the other day, I created an OpenShift account. A free account OpenShift gives you three small gears1 which are individual containers you can run an app on. You can either run an app on a single gear or have it scale to multiple gears with load balancing. You then install components you need, which OpenShift refers to by the pleasingly retro name of cartridges. So for instance, Python 2.7 is one cartridge and PostgreSQL is another. You can either install all cartridges on one gear or on separate gears based on your resource needs2. You choose your base platform cartridge (i.e. Python-2.6) and you optionally give it a git URL to do an initial checkout from (which means you can deploy an app that is already arranged for OpenShift very fast). The base cartridge sets up all the hooks for setting up after a git push (you get a git remote that you can push to to redeploy your app). The two things you need are a root setup.py containing your pip requirements, and a wsgi/application file which is a Python blob containing an WSGI object named application. For Python it uses virtualenv and all that awesome stuff. I assume for node.js you’d provide a package.json and it would use npm, similarly RubyGems for Ruby etc. There’s a nifty command line tool written in Ruby (what happened to Python-only Redhat?) that lets you do all the sort of cloud managementy stuff, including reloading cartridges and gears, tailing app logs and SSHing into the gear. I think an equivalent of dbshell would be really useful based on your DB cartridge, but it’s not a big deal. There are these deploy hooks you can add to your git repo to do things like create your databases. I haven’t used them yet, but again it would make deploying your app very fast. There are also quickstart scripts for deploying things like WordPress, Rails and a Jenkins server onto a new gear. Speaking of Jenkins there’s also a Jenkins client cartridge which I think warrants experimentation. So what’s a bit crap? Why isn’t my app running on OpenShift yet? Basically because the available cartridges are a little antique. The supported Python is Python 2.6, which I could port my app too; or there are community-supported 2.7 and 3.3 cartridges, so that’s fine for me (TBH, I thought my app would run on 2.6) but maybe annoying for others. There is no Celery cartridge, which is what I would have expected, ideally so you can farm tasks out to other gears, and although you apparently can use it, there’s very little documentation I could find on how to get it running. Really though the big kick in the pants is there is no cartridge for Postgres 9.2/PostGIS 2.0. There is a community cartridge you can use on your own instance of OpenShift Origin, but that defeats the purpose. So either I’m waiting for new Postgres to be made available on OpenShift or backporting my code to Postgres 8.4. Anyway, I’m going to keep an eye on it, so stay tuned. I’m visiting my parents for the long weekend. Sitting in the airport I decided I should use my spare time to write some documentation, so sitting in the airport was the first time I’d tried to connect to work’s OpenVPN server. While it’s awesome that Network Manager can now import OpenVPN configs, it didn’t work because NM doesn’t support the crucial keysize parameter. Rather than work around the problem, which some people have done, but would annoyingly break my other OpenVPNs, I used the fact that it’s open source to fix the problem properly. My Dad asked if I was working. No, well, not really. I’m fixing the interface to my VPN client so I can connect to work’s VPN, I replied. Unglaublich! my father remarked. Not unbelievable, because it’s open source! I’m really hoping that someone can provide me with some enlightenment. I have a lot of ssh keys. 6 by today’s count. On my desktop I have my ssh configured with IdentitiesOnly yes and an IdentityFile for each host. This works great. I then forward my agent to my dev VM. I can see the keys with ssh-add -l. So far so good. If I then ssh into a host, I can see it trying every key from the agent in sequence, which is sometimes going to fail with too many keys tried. However, if I try IdentitiesOnly yes in my dev VM config, it doesn’t offer any keys, if I add IdentityFile it doesn’t work because I don’t have those key files on my VM. So what’s the solution? What I want is to specify identities by their identifier in the agent, e.g. danni@github, however I can’t see config to do that. Anyone got a nifty solution?